If you are not sure of your situation, please choose “I do not have an account”. You are free to donate the amount you wish, and decide whether you would like to receive counterparts in return for donations from 10€ on. Thanks! *Tax relief only applies if you are paying income tax in France. Same previous counterparts as well as an invitation to a webinar explaining and bringing down preconceived ideas on energy transitions (in French only). *After tax relief, a 50€ donation will effectively cost you 17€. Same previous counterparts as well as an invitation to a webinar on energy sufficiency (in French only). You will also receive our latest publication on sufficiency (English version available). *After tax relief, a 100€ donation will effectively cost you 34€. 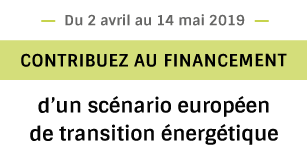 Same previous counterparts as well as a copy of the book “Changing energies” signed by one of the authors from négaWatt (in French only) *After tax relief, a 250€ donation will effectively cost you 85€. Same previous counterparts as well as free membership to négaWatt association for 2019, and a copy of the négaWatt manifest (in French only) *After tax relief, a 500€ donation will effectively cost you 170€. Same previous counterparts and an invitation to next négaWatt autumn university (11th and 12th of October 2019 in Mèze – excluding transportation). *After tax relief, a 3000€ donation will effectively cost you 1020€.